Taking shelter from the hot mid-day sun bearing down on Crenshaw Blvd., I struck up a conversation with a security guard that had worked in the area for a number of years. As we surveyed the evolving stretch of the boulevard sprawled out before us, we talked about the pending Friday night closure of the boulevard between Martin Luther King Jr. Blvd. and Stocker St. for reconfiguration, the new “District Square” development slated for the site at Rodeo and Crenshaw, and the fact that Crenshaw Square, a massive structure hosting a number of local businesses just south of the District Square site, was for sale. No one is really sure what kind of transformation the new rail line will bring when it finally opens in 2019. But, they do know that they will have to navigate their way around a lot of construction in the meanwhile. 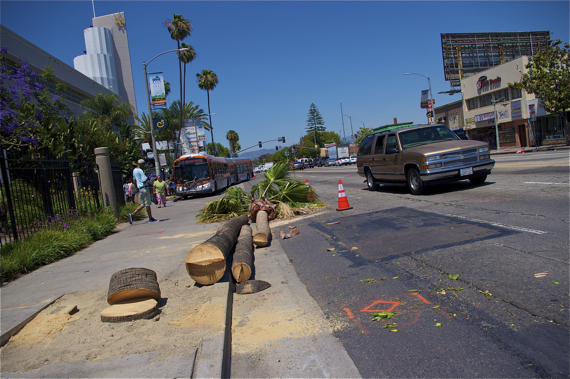 Much noise has already been made about the impact the removal of 150 trees will have on the community. But, this weekend, in particular, promises to be a bit chaotic, as Metro undertakes its first major (but very temporary) street closure. From 10 p.m. to 2 a.m. Friday evening, the closure will extend all the way from Jefferson Blvd. to Vernon Ave. Traffic will be diverted to Arlington (for those looking to continue on major streets), although northbound traffic will be able to rejoin Crenshaw at Rodeo. From 2 a.m. to 1 p.m. Saturday, the boulevard will remain closed between Stocker and MLK (although those streets will reopen to east-west travel), with north and southbound traffic again being diverted to Arlington. The closure is necessary, said project director Charles Beauvoir, so that existing paint can be ground off the street, new lane markings can be laid down, and the concrete barriers that will wall off the two-lanes construction zone can be installed. 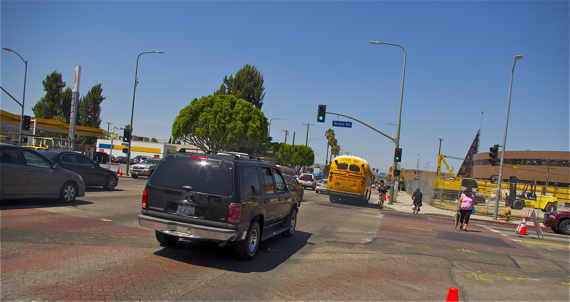 The creation of a construction zone will necessitate the removal of the center turn lane and street parking, as well as the relocation of the northbound bus stop to the southeast corner of Stocker and Crenshaw. As the heavy congestion and poor road conditions on Crenshaw already serve to make it a rather unpleasant ride for those who brave it on two wheels, this new configuration doesn’t look too promising. It also has local community members wondering where they fit into this process. During the reddit discussion Metro hosted Tuesday night in anticipation of questions about the traffic reconfiguration, a number of the questions instead revolved around jobs, concerns about gentrification, and Metro’s outreach strategy to local businesses. Jobs, in particular, has been a hot-button issue, as a major selling point of the rail line to the community was the claim that it would bring thousands of jobs to the area. The realization that the line itself might only generate ~300 jobs and that it couldn’t be guaranteed that the hires would be local (because of the federal funding requirements that hires be drawn from a national pool), left many disillusioned. Speaking Tuesday with Miriam Long, Manager for Regional Communications, she reminded me of our previous conversation where she assured me Metro is both dedicated to using the Project-Labor Agreement (PLA) model in future projects — the stipulation that certain percentages of workers be from disadvantaged circumstances — and that both Metro and Public Works have a significant number of projects in the pipeline for which they should be able to use local hires. Therefore, what she was concerned about, she said, was that those seeking jobs get the proper preparation and training now so they will be able to be competitive when those opportunities come on line. Realizing it isn’t easy for many of those from disadvantaged circumstances to take those first steps on their own, however, she decided she would begin holding weekly Coffee, Conversation, & Careers sessions at the Starbucks (at Coliseum) beginning next Wednesday afternoon. The sessions will be informal and allow her to help potential job seekers think about the range of careers they could have with Metro or connect with PVJobs (hired by contractors Walsh-Shea to facilitate the hiring process and act as liaison with local unions, particularly with regard to disadvantaged workers) or other relevant agencies that can assist them. With regard to small businesses, Metro’s funding sources for the project limit the help they can extend to business owners. Most seems to fall under the category of “mitigation,” where they are able to work with owners on issues of lost parking, signage, or the hampering of deliveries due to construction. That said, with the launch of the Small Business Resources Project-Oriented Discussion (POD) this past January — a work group of the Crenshaw Leadership Council (CLC), the community advisory body appointed by Metro — they are looking to connect small businesses with the information and resources they need to survive and even thrive during construction. Metro Business Liaison JC Lacey underscored that, for struggling business owners with limited time, resources, or business education, information and connections with the right people can be very powerful tools. Simple things like an introduction to someone that can help them with permitting (i.e. to be able to accept EBT), offer business coaching or assistance with a business plan, or provide them with micro loans could help put a micro-enterprise owner on more solid footing. It isn’t a perfect solution — just because the resources are there, it doesn’t necessarily mean people can access them or that they will fit their needs. Much like in the case of the corner market makeover I recently covered in South L.A., owners might find working with micro-lenders is far more complicated than trying to scare up funds on their own. But, giving business owners the opportunity to learn more about how to navigate what can be a complicated landscape is a good start. 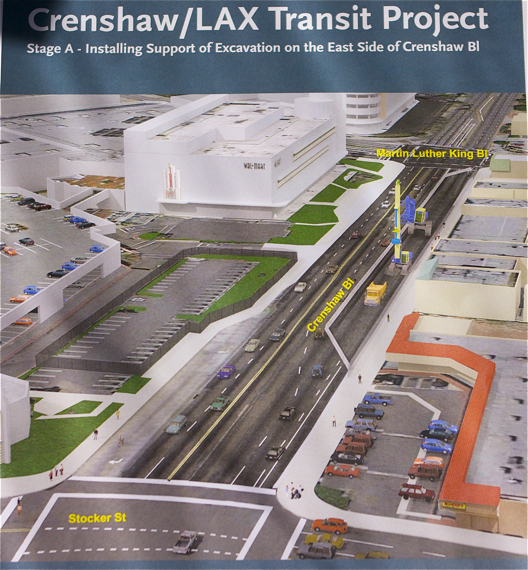 For more information on the closure of Crenshaw this weekend, please see Steve Hymon’s comprehensive post here or go here for general construction notices, including information on the upcoming (temporary) closure of Crenshaw at Exposition for a similar reconfiguration on May 16th. For more information about CLC and POD meetings please see the calendar and meeting minutes, here. 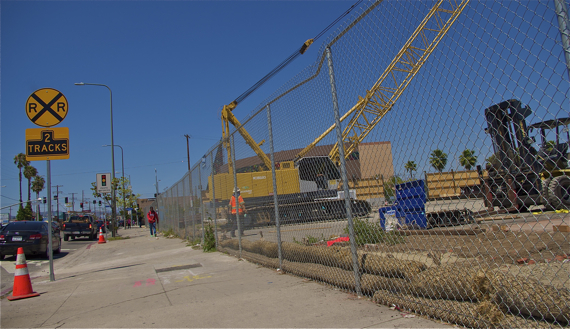 For information on business opportunities for Disadvantaged Business Enterprises hosted by Walsh-Shea Corridor Constructors, please attend the May 14th (9 – 11:30 a.m.) outreach event at Rogers Park, 400 West Beach Ave. in Inglewood or contact veronicamartinez(at)walshgroup.com. The flyer for the meeting can be found here.